Some of the best decisions are made last minute! For those of you that are wondering what i'm talking about.. I started a brand NEW podcast series with Gabi the owner and founder of Rodeo Wrecks called "Rodeo Chat Gets Wrecked". Well, we decided to take a trip down to Las Vegas for the PBR World Finals to get the word out about our new podcast series! The minute we got into Vegas we went straight to work! First stop, was MGM! At MGM we met up with some folks that we met at the PBR finals last year such as PBR Stock Contractor Kaley Mae Hook and PBR Bull Rider Jory Markiss. We met some new faces at the MGM draft party for round 4 of the pbr finals! 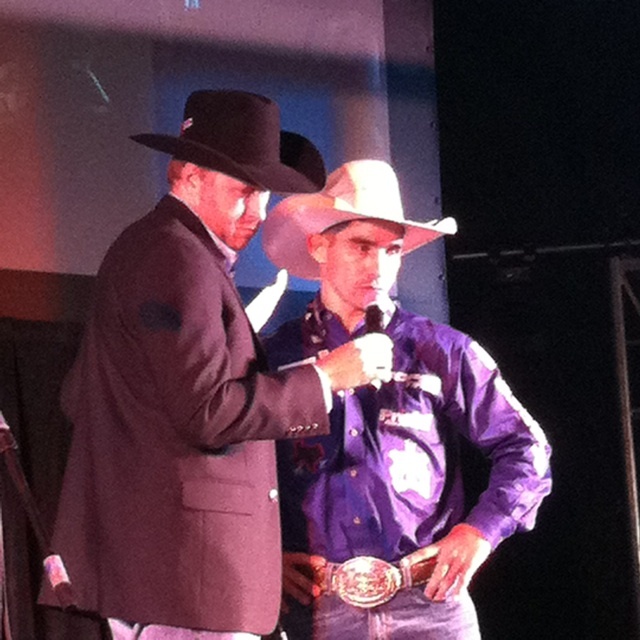 We had the chance to meet PBR Canada bull rider Tanner Byrne who was in the running for PBR rookie of the year! We also met Gage Gay who was in the lead for PBR Rookie of the year! By the way, it was Tanners and Gages very first time riding at the PBR World finals in Las Vegas! 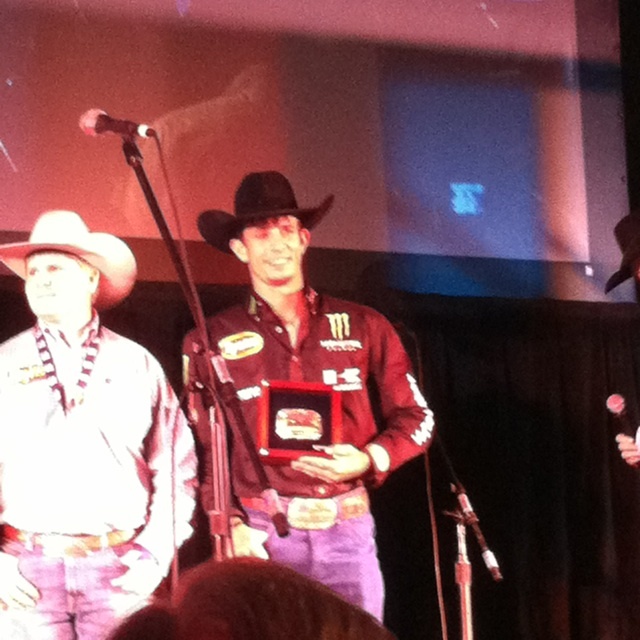 Turns out, JW Harris picked up the 2014 PBR Rookie of the year title. Many, of you have probably seen JW Harris on the PRCA and CBR circuit.. But, JW Harris decided he wanted to give the PBR trail a shot this year, and for his first year on the PBR trail I think he did great! 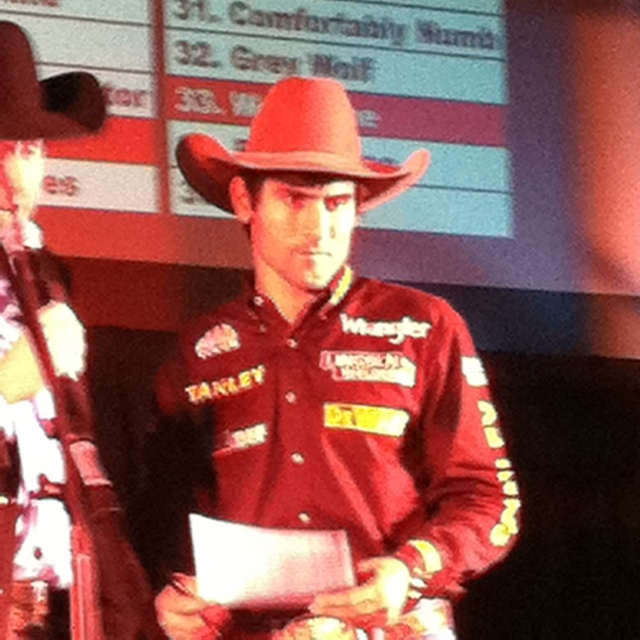 Personally, I think its pretty amazing that JW Harris is on the PBR tour and made it to the PBR finals. Just goes to show that PRCA and CBR bull riders can ride rank bulls too! This year's PBR Finals were bitter sweet! PBR Bucking Bull, Bushwacker bucked out for his very last time! I had the opportunity to see Buschwacker buck out in Nashville and it was one of the most amazing sights I've ever seen! Buschwacker, is so wicked and different.. I know, that I'll never see another bull out on the PBR trail like Buschwacker. Buschwacker was named 2014 PBR Bucking Bull of the year. What a way to go out on top! Me and Gabi's favorite bull rider is, Silvano Alves! Why? Because He's different, and consistent. Silvano, was paired up with some of the rankest bulls at the PBR Finals! For Example: Asteroid, Freakster and Hokey Pokey. Guess what folks?! Silvano, battled all the hate and boo's by winning the event average by riding all of his 6 bulls and he took over the #1 spot in the standings! Silvano Alves, is your 2014 PBR BFTS World Champion Bull Rider and the richest western lifestyle athlete to date! By the way, this was Silvanos Alves 3rd time winning the PBR Finals and being crowned the world champion bull rider! In my opinion, Silvano Alves shines the brightest when the haters hate. Now that the PBR Finals are over.. I wonder if any of the PRCA or CBR guys will jump on the PBR tour in 2015! Only time will tell..